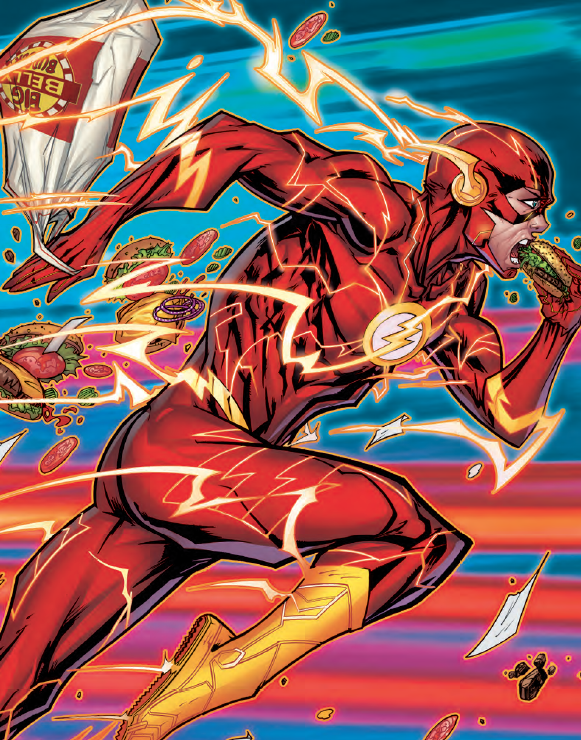 The Flash #53 Review – AiPT! The Strength Force gets a whole lot heavier. The Flash is encountering new threats never before seen in any dimension, which has further made this comic all the more interesting. The Strength Force has taken over Trickster and made him as big as Doomsday, but can Flash and Captain Cold stop him? Hell, who is Captain Cold again? Find out here. Joshua Williamson has done a great job keeping this series fun with a good mix of serious drama. He’s aided by Christian Duce who knows how to draw superheroes. Captain Cold has seen some stuff. Credit: DC Comics. Williamson appears to be on a pun streak, keeping things light as the action gets heavy and the stakes are raised. This issue begins where we left off last issue with Trickster rampaging as a super strong (and huge) villain. Williamson explores that with some delightful moments that are surprisingly genuine and real. Take for instance Trickster marvelling at how strong and hot he is now. Who wouldn’t react that way if turned into a giant muscle? This also helps add a bit of levity to an otherwise super serious story. Captain Cold opens this issue with a dramatic flashback to when he was a cop in the future. This helps flesh him out and give some context as to why he’s fighting on his own. The dynamic between him and Flash is particularly interesting because they have different approaches with both teaming up to try Flash’s plan of saving Trickster and not killing him. I’ve always enjoyed a good buddy cop film and you get that vibe between the two here. There are a lot of rippling muscle-clad panels in this issue and Duce nails them all. Trickster’s giant arms are very realistic (some say hands are the hardest thing to draw, so bravo to you, Duce) and there are ’90s vibes in his style. Dare I say there’s a Todd McFarlane thing going on here? Mr. Fantastic looks weird. Credit: DC Comics. I’d like to think there’s a science to these forces in play, and the comic does a decent job making you believe it, but at the end of the day I’m more confused by these forces than intrigued. Give us a little more on how they work and why and it’ll become more interesting and the reader will be more invested. At least give us some rules. As it stands, things sorta happen just because, and while I’m sure there will be some explanation down the road, right now I’m scratching my head wondering when it will make sense. A good issue for action fans with Flash and Captain Cold doing all it takes to stop the first Strength Force villains to ever punch them right in the teeth. Flash’s world is getting more interesting by the issue. A good action focused issue.